Pupil of his cousin - artist Ludovico Carracci, Annibale studied the works of Correggio, Tintoretto, Veronese, Raphael and Michelangelo. Since the founding of the Academy degli Incamminati he took an active part in pedagogical and creative activities of this institution. In 1597 Annibale Carracci was invited to Rome cardinal Farnese for registration of the Palazzo Farnese fresco paintings on mythological subjects. Despite General recognition of the artist, Annibale Carracci died at age 49 in poverty and was buried in accordance with his last request in the Pantheon, next to Raphael. In addition to paintings spiritual, allegorical and mythological content, he also painted landscapes. The update task of painting of his time took on itself the Bologna artists brothers Agostino and Annibale Carracci and their cousin Ludovico. In its struggle with mannerism Carracci brothers tried to use the Renaissance heritage, which they perceived as ideal as the upper limit of the development of art. To publicize his ideas Carracci founded in Bologna in 1585 the so-called "Academy aimed at true way", which was a prototype of later art academies. Actually, it was a private workshop, where the training and improvement of painters under the special program. The Academy has joined a very small number of artists and lasted long. But Carracci first practically created artistic school developed a program of training. The disciples were taught perspective, architecture, anatomy, history, mythology, drawing from ancient casts and from nature and, finally, the practice of painting. The leadership Academy brothers divided accordingly personal inclinations: the whole work was headed by a senior Ludovico, Agostino read theoretical lectures, Annibale conducted practical lessons in drawing and painting. Of the three brothers Annibale was the most talented. Passionately would go to bed to his business, he worked quickly and with enthusiasm, was keenly debated opponents, quarreled with his brothers, deriding aristocratic habits Agostino and pedantic Ludovico. All the best that was in him, Bologna academism is obliged Annibale, which actually was a leading figure of the new movement. In 1580-1590 years together with his brothers Annibale painted frescoes Palazzo Bologna nobility (Fava, Magnani, Zambeccari) and a number of palaces of Bologna. In the emerging new type altarpieces best works belong Annibale - "Ascension of Mary" (1587), "Madonna with St. Luke" (1592). In the eighties along with the works on religious subjects Annibale wrote a few brave realistic paintings: "butcher's Shop", "self-Portrait with the father", "Consumer beans". A special group represents paintings Annibale on mythological themes, which affects his fascination with the Venetians. In these pictures, celebrating the joy of love, the beauty of the naked female body, Annibale reveals itself to be a good colorist, vivid and poetic artist ("Venus and Adonis"). In 1595 Annibale moved to Rome, where at the invitation of cardinal Odoardo Farnese began work on the decoration of state rooms of his Palace. After a relatively minor painting of one of the rooms of the Palazzo Farnese Annibale in 1597-1604 years with the participation brother Agostino and students painted the large gallery of the Palazzo Farnese. These frescoes brought him worldwide fame and became an example for many decorative ensembles of the XVII-XVIII centuries. As the program paintings the artist was proposed theme of the triumph of love. In the corners of painting Carracci created the impression breakthroughs in the wall, through which can be seen is how far away in the depth - dancing on the parapets figurines of cupids. Such illusionism, such a violation of the integrity of the painting surface traits deeply alien to the Revival, but found development in art of the XVII century. Together with accent supply various elements of painting, together with the dynamics and decorative wealth of the whole these features characterize painting gallery Farnese as the product, according to the spirit wholly owned Italian decorative arts of the next century" (N.A. Livshits). The best works of Annibale Carracci belong to his landscape work. Mannerism is almost completely forgot this genre. Carracci and his pupils created on the basis of the traditions of the Venetian landscape of the XVI century the type of so-called classical or heroic landscape. "It is exactly the way the artist finds the most flexible resolution of the contradictions of his image-oriented vision, achieving merge their ideas about perfectly fine with a wide generalization of reality. Here, and has created a type of "heroic landscape", originates fruitful trend, then found its continuation and development of the masters of the next generations, in particular from Poussin. Novelty found Annibale decisions, especially clearly expressed in the "Flight into Egypt" (1603-1604), is simultaneous contrast and harmonic consonance limited in time and space being individual motives, among which highlighted the dominant (the Holy family on the banks of the river), and infinite latitude and peace everlasting existence of nature as a whole" (M.I. Svidersky). 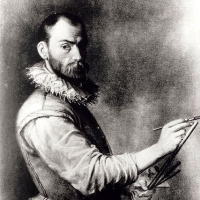 Interestingly, Annibale Carracci, so consistently, speaking as a Creator of a new, "elevated" style known also as the author of genre compositions, written simply and with great scenic ease. "His "portrait of the artist" sorrowful emotion image resolutely stands out from all official works of the master. These realistic aspirations, spontaneously psoriasisa through the academic doctrine, but unable to destroy it, especially badly affected in the drawings Carracci. Excellent draftsman, he felt in figure freer from his / her relative artistic canons: no wonder his name is associated with the renewal (after Leonardo da Vinci) of this genre, as a caricature. In the drawings from life, it reaches a wonderful natural and exact accuracy, which, however, in the subsequent process of idealization images are lost in its complete pictorial compositions. This contradiction between realism study and conventionality the completed image generated by the entire essence of the creative method Carracci, now became the characteristic feature of every academic art". Easel paintings Annibale Carracci, made in the Roman period art, mainly devoted to religious subjects. Cold perfection of forms leaves them little space feeling. Only in rare cases, the artist creates a work of a plan. This is the Lamentation of Christ" (about 1605). "This painting belongs to a group of his Mature works, written with great skill, visibly and clearly, but very cold, - writes N.A. Livshits. He triumphed over mannerism, natsionalisticheskie and consistently built-term, showed the volume of the shapes and the distance; but at the same time he walked away from bold realistic works of his youth, creating a common, however far-fetched pathetic piece. Legend taken by the artist as the story tells us that the saints ' admirer of Christ are to worship his tomb, but find it empty; from the angel sitting on the edge of the sarcophagus, they learn of the resurrection of Christ. The legend says the angel, "his appearance was as lightning, and women happy and shocked. But the imagery and emotion of the ancient text not find Carracci any response; he could only oppose light, sinuous outlines of service angel massiveness and static character of women's figures. The painting is elementary, and even rude, but has strength and intensity. Died Carracci 15 July 1609. Annibale and his brothers had left many students, among which the most famous Guido Reni and Domenichino.